As a Paralegal with Mason Caplan Roti LLP, Paige has carriage of Small Claims Court actions exclusively in the area of subrogation. Her main areas of focus include motor vehicle accidents, property damage, product liability, water damage and fire claims. 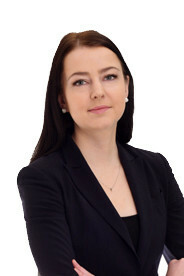 Prior to joining Mason Caplan Roti LLP in May of 2018, Paige worked for an employment and labour law boutique, specializing in employment law and human rights disputes on both the employee and employer side, and was also employed with one of Canada’s national law firms in Ottawa, Ontario. Paige presently has over four and a half years experience in the legal field, having appeared before the Ontario Small Claims Court as well as various tribunals. Paige graduated with Honours from the Humber Institute of Technology and Advanced Learning’s Bachelor of Applied Arts – Paralegal Studies Degree in 2015. Throughout her degree, Paige was an active member of the school’s mooting team, and the recipient of numerous advocacy awards.